It’s a typical question, but it is asked nonetheless — How is this pregnancy different from the first? It is the first “second time around” for me so of course I’ve been thinking about the answer. That’s not to say that I haven’t been subconsciously comparing it in my head all this time – symptoms, emotions, food intake and physical conditions, amongst others. First Trimester Survival. 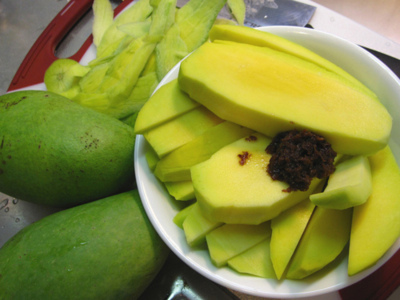 During my first pregnancy, I was in Manila, where a lot of comfort food staples like fresh buko juice (coconut water), inihaw (grilled pork and sometimes chicken), sago’t gulaman (a sweet dessert drink with tapioca balls), manggang hilaw with bagoong (green native mangoes with shrimp paste) and local fruits such like lansones were available anytime of the day. I simply had to ask for it. I was also able to ride out bad days by sleeping in, and have someone come over to finish my chores. Here not many staple comfort foods were within reach, and I had to adjust big time (not very easy for a hormonal, emotionally unstable nauseous pregnant woman). The closest buko juice we found was at Whole Foods, and even that tasted different. I had to survive on bottled pickled manggang hilaw which my mom brought from Manila, and of course I ate it in rations so that it would last longer. Luckily the Asian store had the inihaw meat available, so for a time my husband would be grilling like there was no tomorrow, because that’s all I would eat. I also had to force myself to get up and out of bed each day, since we didn’t have someone to do chores for us. And then there was Sam, who needed to be entertained constantly. I was incredibly grateful for the TV so I could sneak in at least 30 minutes for a much needed nap, and I was counting the days until I knew I would feel better. Should it all be for just the 2nd baby? Baby Registry Content. With all first pregnancies, a baby registry contains all the necessary baby gear. But because we already own most of it in good condition (except maybe for a double-stroller), this time around when I filled out our registry at BuybuyBaby, the items were mostly: 1) replacements and daily necessities like newborn diapers, diaper pail refills and breastpump parts, 2) a few pink items like changing pad covers (since the first time around, we didn’t know if Sam was a boy or girl so I had to buy in orange and yellow), and 3) several things for Sam. Is that weird? I know the registry is supposed to be for the new baby, however she’s going to inherit a lot of Sam’s things anyway, particularly her clothes. Anyway it’s her sister too, so she should get something in return, right? Preparations Prior to Labor. The first time around there was much to anticipate (obviously I’d never been through labor before). The day I hit 30 weeks I already started preparing the baby clothes and the crib. I got out the breastpump to study it. I read up on labor and pretty much had the hospital bags packed (basically I could have given birth anytime after that). I was anxious about the labor itself, how long it would last and the pain that everyone says is the most you’ll ever experience. Now I feel I don’t have the same anxiety, and I’m able to enjoy the pregnancy more. I can’t believe I haven’t re-opened my What to Expect book. Pain? I’m a little more confident I can manage (please remind me I said that later on!) since I survived it the first time around. Could it be any worse? I’m approaching 35 weeks and we’re still procrastinating on baby preps. Somehow I know I have a few more weeks to go to get that all done. We don’t even have her complete name worked out! But I do know that I am excited and I can’t wait to see her, and I can enjoy that feeling more. They say if your first pregnancy is a positive experience, then you are less likely to worry because you think the second will go just about the same way (even if it could be completely different). I guess that is true. It's a Christmas photo, but it's the first I have of the "two of them"
The main underlying difference though, is Sam. Maybe I’m not anxious or preparing well in advance because all my thoughts and concerns are focused on her and my energy is used up in trying to keep up with her. They all say that a new baby is a big adjustment for the elder sibling. So I worry if she’ll be okay for the 2 nights I’m at the hospital or if she’ll adjust well, and if I’m doing enough to prepare her for everything that’s about to come. I guess like all pregnancy situations, we’ll never really know until we’ve reached that point. As I told some of my friends who are pregnant, it’s the anticipation and the “playing it out in your head” which gets the better of you. When you’re there — you have no choice but to just go with it. So if there’s one thing I’ve learned from one pregnancy to the next, it’s to just do what we think is best for now, and hope it works out for the best as you go along. Watch out for the next installment of What’s the Difference: Labor Round 2! Thanks Tala! yes I’m sure I worry more about her than she really needs me to, hahaha. As is the case with all mothers. Buti here they allow siblings!